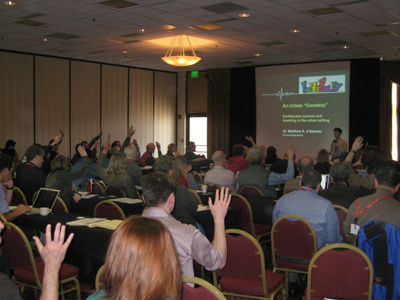 2008 UNAVCO Science Workshop a Success! 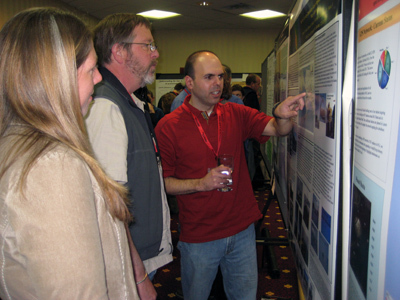 The 2008 UNAVCO Science Workshop, held in Boulder, CO at the Millennium Harvest Hotel from March 11-13, was well attended, drawing 190 attendees from as far away as New Zealand and Italy, including 20 UNAVCO-supported students, three of which are RESESS interns, and 50 UNAVCO employees. The workshop was a mix of Science Session talks related to UNAVCO-supported science, breakout Special Interest Groups (SIGs), poster sessions, and field trips. The four Science Sessions were entitled: Polar Studies and Glacier Dynamics with talks by Terry Wilson, Sridhar Anandakrishnan, Erin Petitt, and Gordon Hamilton, Geodetic Monitoring of Natural Hazards with talks by Geoff Blewitt, Falk Amelung, Matt d’Alessio, and John Braun, Seismic-Cycle Geodesy with talks by Mark Simons, Joan Gomberg, John Beavan, and Kaj Johnson, and Magmatic Systems, with talks by Freysteinn Sigmundsson, Bob Smith, Tim Masterlark, and Bob Lillie. These sessions included such diverse topics as Matt d’Alessio’s talk on teaching urban geology, Erin Pettit’s talk on her Girl’s on Ice program, and Mark Simons talk on Deformation Tomography of the Central Andes. D’Alessio teaches at El Cerrito High School in the San Francisco bay area, which is near the Hayward fault, the site of d’Alessio’s PhD fieldwork. D’Alessio noted that we need to customize our methods when teaching to urban students, and use analogies that they are familiar with, such as using layers of concrete to interpret stratigraphy. Pettit’s Girl’s on Ice Program takes teenage girls into the Cascade Mountains for eleven days to learn about glaciology and mountaineering. The girls construct their own research projects, learning how scientific research is conducted in the field. Simons covered how he uses a variety of techniques to constrain the deformation tomography of the Central Andean Subduction Zone, including InSAR, GPS, and seismology. SIGs are more informal groups with open discussions that met for an hour and a half. They included sessions on strategic direction and new initiatives for polar science, hazards, InSAR, seismic-cycle, and magmatic systems, teaching geodesy to excite students, UNAVCO’s new tripod LiDAR scanner, GPS high rate real-time data, PolarTechnologies, PBO borehole strainmeter and seismic networks, RESESS, GPS data search and access tools at UNAVCO, how to use UNAVCO’s GPS equipment, GeoEarthScope Airborne LiDAR data, PBO data software products and tutorials, and SNARF. 65 posters were presented for the Tuesday and Wednesday evening viewing sessions. Other meeting highlights include Susan Eriksson’s mini-workshop on Teaching Geophysics at the College Level, 14 people participating in a ski trip to Eldora Mountain on Monday before the meeting, Caroline Porco, Director of Mission Operations and Cassini Imaging Team Leader, giving a talk Tuesday evening, “Traveling Saturn” during which she showed spectacular imagery recently acquired by the Cassini mission, a tour of UNAVCO headquarters, and a field trip to see the geology of the Front Range, led by UNAVCO’s Freddy Blume. Thanks are due to the organizing committee, Evelyn Roeloffs, Mark Tamisiea, Susan Schwartz, and Chuck Meertens for the session planning and to Jaime Magliocca and Kate Tallerday for logistics. The next UNAVCO Science Workshop will be in 2010. 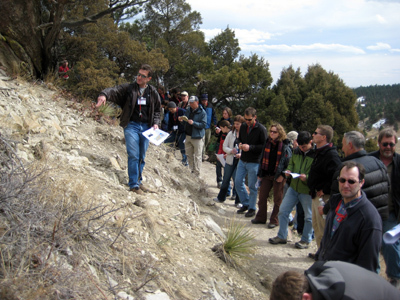 Figure 1 - UNAVCO’s Freddy Blume leading the geology of the Front Range field trip on Wednesday afternoon. This photo was taken on the Mesa Trail, and Freddy is standing in the lower Niobrara Formation, which are Cretaceous fossiliferous limestone ledges. Figure 2 - Many people had questions after Matt d’Alessio of El Cerrito High School gave his Science Session talk: An Urban “Geodesy”: Earthquake Science and Teaching in an Urban Setting. Figure 3 - Max Enders, an Alaska UNAVCO field engineer, explains his poster to Summer Miller, a Southern California field engineer, and Brian Coyle, the Northern California Regional engineer.